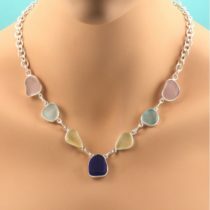 Aqua sea glass is the most alluring of sea glass colors. The favorite of Mermaids, it is a beautiful blue-green hue, the color of the ocean. More than any other sea glass color, aqua is thought to have an aura of serenity and calm that brings to mind pleasant childhood memories of sunny days at the beach! 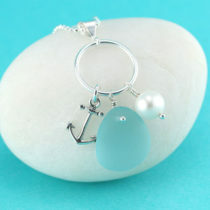 Aqua is our best selling sea glass color. My guess is that it’s so desirable because of its color properties that remind us of sparkling, sun dappled, clear aqua waters. We invite you to learn more about our aqua sea glass, its origins, meaning and rarity so that you can be an educated sea glass jewelry buyer. Then peruse our collection of aqua sea glass necklaces and pendants, aqua sea glass earrings and colorful bracelets made with aqua sea glass. 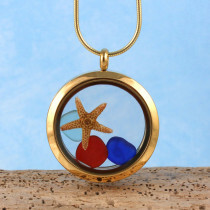 It’s easy to order from our secure online sea glass jewelry boutique. 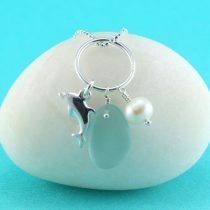 Our pure aqua sea glass designs are lovingly hand-crafted, one of a kind treasures with rare beauty and value. We offer free regular shipping via USPS Priority Mail and we ship your purchases promptly! Why Is Aqua Sea Glass Aqua? It’s rather ironic that the aqua sea glass so prized by today’s collectors had such a modest beginning. As far back as the early 1900s the color was commonly used, mostly to make containers for everything from ink to hair dye. Picture the “snake oil salesman” travelling from town to town offering magical elixirs and curative potions for any ailment and you can be sure they were housed in a bottle or jar that was aqua in color. The reason that aqua glass was relatively ordinary in the 1900s and early 20th century is mostly because it was the cheapest glass color to make. At the time most aqua glass was soda/lime glass made with silica (sand), soda (potash/wood ash) and lime (a stabilizing agent). Ordinary raw sand was plentiful, and, more importantly, it was free which is why it was used in early glass making. Naturally occurring sand contains trace amounts of iron and it was iron that produced the aqua glass color. The more iron content in the sand, the deeper the aqua hue! Where Does Aqua Sea Glass Come From? 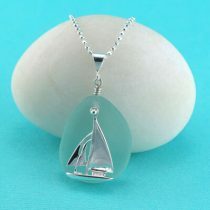 Most aqua sea glass is derived from glass containers used from the late 1800s through early 1920s. During this period aqua glass bottles were commonly found in every household and apothecary (drug store) for products such as medicines, soda/seltzer bottles, electrical insulators for the tops of telegraph poles, ink and milk bottles, hair dye, Mason and Ball canning jars, balms, soothing liniments and even the popular condiments, mustard and horseradish! At the time, most common aqua glass containers didn’t have value so once the liquid was consumed or applied, its container was considered trash and either buried or dumped into the ocean. So the source for the vintage aqua sea glass shards we use in our sea glass jewelry are the very same aqua bottles, jars, and insulators tossed away into the sea so many years ago! Of course, while researching this topic, I couldn’t resist purchasing a three more antique bottles because I absolutely love vintage aqua containers, almost as much as vintage aqua sea glass jewelry! My new “finds” are an antique aqua/blue glass ink bottle and two medicine bottles from the 1890s. One is marked “Lydia E. Pinkham Vegetable Compound” that was marketed as a “women’s tonic,” and one is embossed “Dr. Pierce’s Favorite Prescription,” which I assume was good for whatever ailed you! 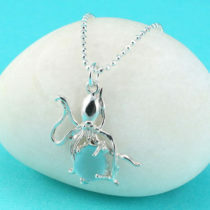 How Rare Or Valuable Is Aqua Sea Glass Jewelry? Aqua sea glass is the most alluring sea glass color, which is why I sell more aqua sea glass jewelry than any other color. 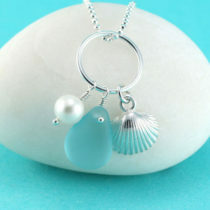 The color, aqua, always fashionable in home decor, clothing and jewelry, evokes a relaxed vibe, an aura of serenity and a pure connection between us and the ocean, bringing us joyful memories of warm summer days at the beach. The color is a spring/summer color, a symbol of renewal and fresh starts. The blue/green hue of aqua is a reminder of ocean waves and waters, images that bring peace and tranquility to the soul. Aqua is a nature color and now that it’s been scientifically proven that exposure to the outdoors helps us to de stress, the demand for aqua everything has increased! Genuine (aka pure or true) aqua sea glass cannot be replicated and its supply is diminishing. After all, most of the original sources for aqua sea glass are well over 100 years old. Demand is rising and supply is falling, a classic scenario that makes the case for aqua sea glass being one of the most valuable sea glass colors. Aqua is the seventh most rare sea glass color. 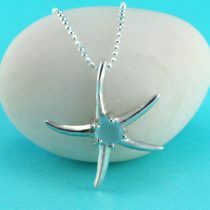 Where Do We Find Aqua Sea Glass For Our Jewelry? My husband and I have been collecting and purchasing genuine sea glass for well over 20 years. 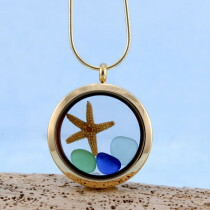 Some of our favorite sea glass sources are Bermuda, Bahamas, Puerto Rico, Hawaii California and Nova Scotia. Sadly, it is more difficult to find jewelry quality sea glass today than when we first began our journey, mostly because there are more sea glass lovers (good news) than ever before, all looking to build their own cherished collections and at times the competition can be quite intense! Luckily for us, we have built our jewelry quality sea glass collection over many years and have enough to satisfy our sea glass jewelry clients for a long time to come! Most of the aqua sea glass we use in our jewelry designs comes from California or Nova Scotia, both from sites where trash was dumped 50 – 75 years ago. Who Should Wear Our Aqua Sea Glass Jewelry? 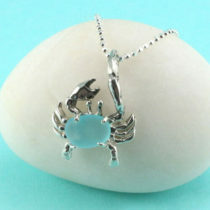 Aqua sea glass is a favored substitute for aquamarine, the March birthstone. 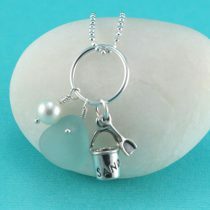 A gift of aqua sea glass jewelry to commemorate a March birthday is a fitting tribute of love and affection. 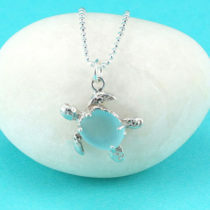 Like the aquamarine gemstone, an aqua sea glass gem is symbolic of happiness, health and hope. It is a mesmerizing color, thought to be the favorite of Mermaids! So if you are a Mermaid, this is your sea glass color! It is believed that wearing aqua sea glass makes it easier to make friends (perhaps because they are admiring your jewelry?). Those who wear aqua are also courageous and are great communicators. Aqua sea glass jewelry is the perfect accent for those who love spring and summer because it is such a beautiful reminder of the season. Aqua is also the color of water, a powerful feng shui element. Wearing an original, one of a kind, aqua sea glass jewelry design is helpful for those trying to create a feng shui energy of calm, peace, quietude and healing in their home environment. As you can see there are a multitude of very good reasons to wear one of Sea Glass Jewelry by Jane’s aqua sea glass jewelry designs. 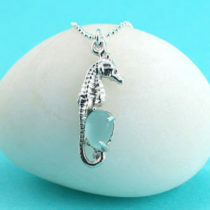 We invite you to take a look at our collection of aqua sea glass necklaces, aqua sea glass earrings and sea glass bracelets with aqua sea glass.